* Marshall pointed out that these days, especially with digital media, it's become very easy to make images both inside and outside the art world, and many people make successful images. But he believes that artists with ambition need to fit their work into the historical narrative of art history, need to understand the implications of their art for its moment. I found these comments somewhat counter to something that Daniel Heyman said the day before. Heyman said that he thinks it's fairly impossible for an artist to deliberately set out to create "The iconic image" for a time, an image that will change history. Heyman feels that the best an artist can do is to work from what obsesses him/her and hope that it makes an impact. That feels more true to me. I think it's easy for a successful artist like Marshall to look back and ascribe reasons for his success, but setting out to fit one's work into the flow of art history is a longshot at best. Understanding the history of art (and human history, for that matter) is vital, but understanding history doesn't mean that you can force your own work to fit an important historical niche. I think that if you're going to try to situate yourself in the flow of history as an artist, the best place to situate yourself is right smack in the middle of your own life, right in this moment in time, and respond to what's in front of you. * Marshall also said that because a teacher has to give everything to the students, being an artist and being an art teacher are not really compatible. I have no way to evaluate if that's true or not, but for the many academics at the conference those words must have been hard to hear. I'd be curious to hear some of the educators respond to that. * Marshall also had a strong message for young artists not to depend on other people to decide the value of your work; to take control of defining yourself. He said that an artist needs to distinguish him/herself by creating work that's undeniably profound and provocative, so people have to deal with it whether they like the work or not. One way he mentioned for taking more control is to write, and to write critically. I think he means academic writing, but I would stretch his words to mean just writing. As I've been writing this blog for the past almost 3 years, I've learned so much about my own art and my own process by articulating it. I think that far too few artists have the ability to articulate what they're doing in their own work. * Marshall is an advocate of the artist as scientist. He says that the idea that the artist is some kind of medium who channels art as if in a trance is a myth that many artists buy into. For Marshall, an artist takes things that he/she understands and fuses them with new things to make new compounds, new elements. In his own work, he says he makes clear choices and doesn't leave a lot to chance. No "happy accidents" for Kerry Marshall! I enjoyed his talk very much and am still pondering a lot of this material. Some of the panel presentations were pretty heady. Sometimes I really like heady, but it's tiring. Or maybe I should say it's "filling." I only made it through part of the Friday afternoon panel I attended, which was called "Mediated." - How does our experience of the world come back out in our art, e.g. how is our experience mediated within us? Winn spoke of being interested in "failures" in his art making -- failures of the human hand, failures of tools, and failures in materials. That was very interesting and helpful for a perfectionist like me to hear, an invitation for me to be less critical when I experience such failures and to incorporate those failures into my work more readily. Maybe even to look for the failures. Maybe those failures are actually the portals into something new and unimagined. This was a great takeaway for me. Brant Schuller, whose work I had previously seen (maybe in Art On Paper?) showed samples of some of his tracings of television programs. He tapes vellum to his TV screen and makes tracings as he watches a show or movie, transforming his viewing experience from passive to active and re-mediating what is already a mediated experience. The drawings that result, which trace movement as well as objects, look nothing like TV programs and are quite interesting to see. This Friday morning panel was one I had been looking forward to since I first read about it in the conference materials, a panel with Daniel Heyman and Sandow Birk titled "The Printmaker In Wartime." I first discovered the work of Daniel Heyman in 2005 when I was searching for other artists who work with moku hanga. Daniel's woodblock prints can be seen here. His recent work has involved making images (watercolors and drypoint prints) about the abuse and torture of innocent Iraqis at Abu Ghraib and other prisons. For this work, Heyman sat in on interviews with over 25 former detainees, painting their portraits and taking down their own versions of what happened to them at the hands of the American captors. Three of these detainees have since been killed in the war. There are a lot of remarkable things about Heyman's Iraq work, but one of the most striking things is that he sits in the interviews drawing on copper plates with an etching needle. Since the words that are being said are so intense and affecting, Heyman knew immediately that he wanted to include the stories in his portraits. This means that, since he's making a printing matrix, Heyman is writing backwards on the copper. Sandow Birk is a Los Angeles based painter, who in 2007 was invited to Hui Press on the island of Maui where he created 15 large-scale (48 x 96 inches) woodcut prints that follow the course of the Iraq war. The prints are closely based on a series of prints from 1633 by Jacques Callot called "The Miseries of War." Two hundred years later, the Callot prints were referenced by Goya for his aquatints, "The Disasters of War." Hoping to have a similar impact, Birk is now referencing Callot again 200 years after Goya. Most impressive to me was hearing something about the process from master printer Paul Mullowney. The project took over a year and, given the size of the 4' x 8' birch plywood blocks, power tools were used. Birk would make drawings on 11 x 17 inch paper and then the drawings were blown up and pasted on the boards to be cut. The Japanese paper was smaller than the board, so several sheets were joined and then the prints were hand burnished with ball-bearing barens. Most surprising to me, the prints were made in a tiny edition of two, so unlike most woodcut prints they are extremely expensive and extremely unavailable. There is a catalog/book, however, for those who want a replica to look at. I found both projects really interesting, but I have to say that Heyman's project touched my heart deeply, which is something I value a lot in art. The intimacy of the portraits, the depth and suffering and strength expressed in the stories, and Daniel's clear respect for his subjects as well as the longing for justice he communicated were beautiful. Daniel Heyman is definitely my new crush. At the Hartnett Biennial of American Prints at University of Richmond two subtle and elegant letterpress prints caught my eye and really touched me, one called "Luft" dealt with the atmosphere and the one above called "Bay of Pigs." The prints, by Dirk Hagner, are some of the least heavy-handed works about our environmental problems that I've ever seen. When I got back to the hotel I checked out Hagner's web site and discovered that he makes gorgeous woodcut portraits. Woodcut lovers, go have a look! His work is subtle and bold at the same time, a stunning combination. More gallery receptions tonight, including Gallery 5. Christina Hung, "Stay the Course"
In a panel discussion called "Caught in the Web" that examined how the internet is affecting printmaking narratives, artist Christina Hung showed work that was essentially printmaking with bacteria. Using nutrient agar as "paper," bacteria as "ink," and non-nutrient agar as "resist," Hung creates living images in petri dishes. Jon Lee, a professor in San Antonio Texas, did a demo ostensibly about using digital methods to design moku hanga prints. As far as I could determine, that's not actually what his demo was about, but he did show some fascinating ways to make your own tools for moku hanga. In his classes he has his students make their own knives, baren, and brushes. Lee also makes his own paper and sizes it. An interesting tip about knife sharpening stones: Lee says he boils Arkansas stones to remove the oil and convert them into water stones. The Keynote was delivered by Shelly Bancroft and Peter Nesbett, co-publishers of Art On Paper magazine and co-directors of Triple Candie, a nonprofit art venue in Harlem. Their wide-ranging talk gave an overview of a number of leading issues in the art world and more specifically the printmaking world today -- issues of collaboration, uniques vs. multiples -- but with my background as a commercial illustrator I most enjoyed hearing what they had to say about the magazine. They pointed out that often times the decisions they make from a graphic design standpoint can "misrepresent" the art they show. For example, large scale work is reduced or colors don't translate properly in the CMYK format. Design decisions end up being curatorial decisions, as some works are excluded based solely on the fact that they won't hold up on the printed page because they're too subtle, or there's a graphic preference for vertical pieces in a vertical magazine format, or a tendency to choose strong colors. I had never thought about the curatorial role of an art magazine in quite that way before. Next I went to a demonstration of CMYK Xerox transfer by David Jones, founder of Anchor Graphics in Chicago. Also known as gum transfer or paper plate lithography, the technique can print anything you can xerox. Jones works from his own photographs. He scans the photos and uses Photoshop to make CMYK color separations which he prints out on 8 1/2 x 11 inch paper using a fairly coarse screen. Then he enlarges the printouts and prints them with CMYK inks as paper plate lithographs. Here's a sample print and a closeup so you can see the dots in the screen. It's a lovely effect. It's too late for me to blog more -- I'm exhausted! But I have a couple of demos to tell you about and lots of interesting gallery shows. There are 23 Richmond Galleries that have participated in this conference in some way. I'll try to do another post in the morning. Today is the big arrival day for the SGC Conference. The photo above is a shot of the check-in area at the VCU Fine Arts Building. I got in pretty early, so I dropped my bags off at the hotel and wandered around the VCU area to get my bearings. Of course one of the first things I did was to check out Gallery 5 where the Repressed III show is happening. Not sure who created the dimensional work in the center of the room. Might be Marwin Begaye. I especially like the parachutes above the "city." My work looks small in the room, but they chose a good spot for it. This evening there were receptions at the VCU Galleries. My favorite was seeing the Portfolios by SCG members, all various takes on the conference theme of digital media and printmaking. Here's a shot of prints from a portfolio called "Hardwired for Pattern." Another portfolio I really liked was one in which each printmaker was asked to make two prints, one entirely digital and one entirely traditional, on the same theme. Click here to read descriptions of the various portfolios. I met my friend Cindy Woods, sketch blogger extraordinaire, for dinner which was my favorite part of the whole day. We drew each other for dessert. Thanks Cindy and Ronda! On Wednesday I leave for Richmond to attend the annual Southern Graphics Council (SGC) Conference at Viginia Commonwealth University. It's said that the SGC is the largest print organization in North America and that the annual conference is the largest yearly gathering in the field of printmaking. The committee is expecting over 1000 people in Richmond this year. So I thought it might be a good idea to make up a few business cards. I got out a couple of stacks of rejected prints, laser-printed my contact info on some sticky-backed labels, got out my X-Acto knife and went to town. I think I made about 400 business cards! I plan to blog from Richmond, so stay tuned if you'd like to vicariously attend the conference. This year's conference topics will focus on the integration of digital media and printmaking. It's been a while since I last posted. Been working the learning curve at etsy.com! An interesting thing happened yesterday that I want to write about. I have a Google alert set up for the word "woodblock" and yesterday I was alerted to a blog post by writer/author Karen Coates that turned out to be a post about Tibet mentioning woodblock-printed Tibetan prayer flags. I've been following the recent news stories about the demonstrations in Tibet and feeling the familiar "what can I possibly do?" feeling. But after reading Karen's post it struck me that there are local actions I can take. Regular readers of this blog will recall that the Dalai Lama came to my town last spring. During his visit I became aware that there's a fairly large (100 or so) population of Tibetans in my area, so I decided to go to the local Tibetan store and talk with the owners. What I discovered is that this is a very emotional time for the Tibetans. They have a feeling of now-or-never prompted by the Chinese hosting of the Olympics and the plan to carry the torch through Tibet. Many feel confused, afraid, frustrated, angry, very sad and also resolute. And they are deeply encouraged and moved and heartened when the wider community listens to them, when we extend our support. Pretty, isn't it? I might use it as part of a larger print sometime. 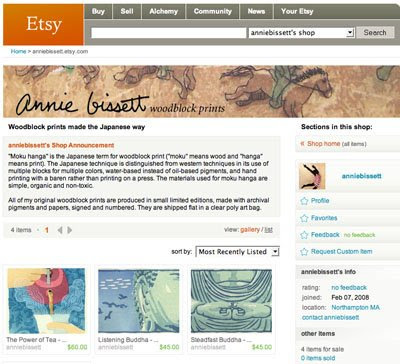 I first heard about etsy, the online marketplace for buying & selling all things handmade, from printmaker m lee, who was an early adopter and still is a very successful shop owner. Etsy has grown exponentially since then and although I've wanted to open a shop I've been hesitant to add yet another website to my list of sites to attend to -- my illustration portfolio on the ispot.com, my own web site, my blog, my portfolio at the Directory of Illustration. It's a tough act to juggle, and I barely get out of the house on weekdays as it is! Nevertheless, I finally took the plunge. Maybe having an etsy shop will allow me to take more walks to the post office! I've opened a store, with the simple URL AnnieBissett.etsy.com, and I'll slowly be listing all of the prints in my flat files. I hope you'll visit! Here's the final Mecca print. I had a tough time printing the border. I've gotten very heavy-handed with the baren since I started working on large prints, but the border needed a light touch to print properly. It took me a number of prints before I got the feel for this block. Still, I managed to get an edition of 24. Thanks for taking this journey with me. The next print in this series will be Lumbini where Buddha was born, but I may take a break from these large prints and work on another piece first. I'll let you know.